As we sit back and reflect on the year that has been, we feel confident in saying that 2011 has been one of our best seasons from the past 28 years in the safari industry. A statement like the above is a bold one, considering the rich history of hunters, friends, professional hunters (PH), and safari staff from the past. 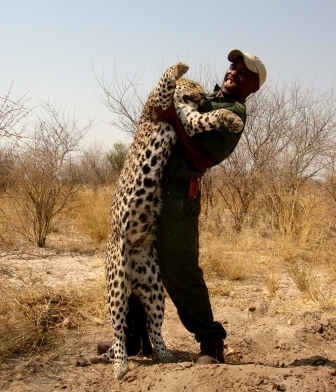 But when one considers the quality of the safaris conducted, combined with the highest level in trophy standards and areas, it goes without saying that the proof lies in the pudding – ultimately this year’s results. Our hunts started earlier than usual, running from mid February to the end of October. We welcomed back many old faces and walked away with a host of new friends. The United States once again lead the way with the most hunters, followed in close pursuit by Spain and Scandinavia. While the previous six years has been ravaged by drought, this season started with floods. The East Cape had more rain during 2011 than in the past five years. That not only allowed our hunters to hunt in some of the very best conditions of recent times, it also saw a remarkable rebirth of our areas and landscape. Game thrived and many species have calved two months earlier than usual. One can only imagine what good tidings this holds for future hunting. This season once again produced a number of world-class trophies. While the PH’s have selected a few favorites we apologize in advance if we missed one or two monsters. Join us and come along to meet the lucky hunters who found themselves in the right place at the right time. 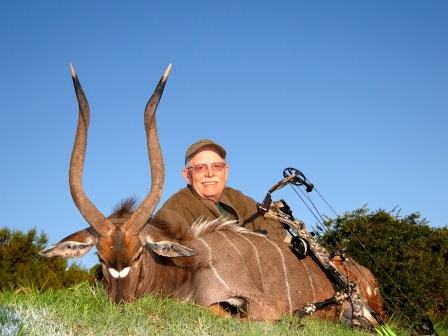 We’ll start with the all time favorite for all first time hunters to Africa – Ann Wilde’s 52’’ East Cape Kudu was our first bull of the season, it also turned out to be one of our best. Dusty Phillips’s “Ghost of the Darkness” monster Bushpig was most certainly the beast of the season. 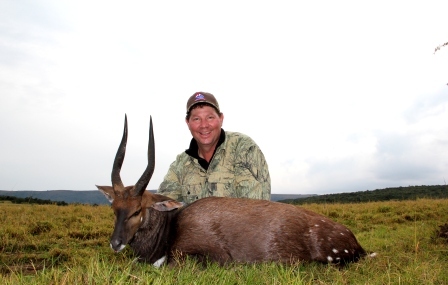 Jim Haselberger needed no second invitation when his Nyala stepped out within bow range. 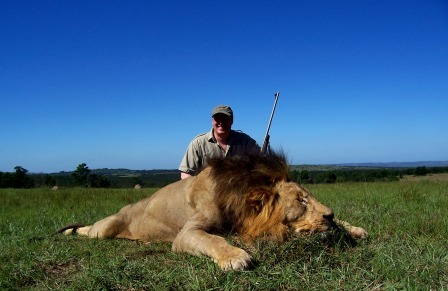 The king of cats was hunted by Jeff Edland. 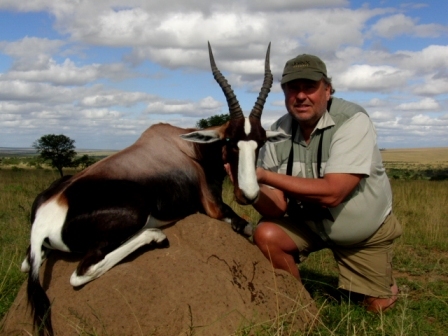 Big Waterbuck have become a tradition at John X Safaris; Dave Kjelstrup’s bull ensured our reputation was not going to be threatened during 2011. 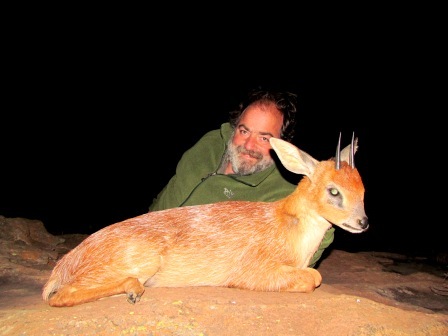 An often overlooked species, the Mountain Reedbuck, can be one of the most difficult species to achieve that unbelievable trophy quality. Professional Hunter, Greg Hayes, together with his tracker, Mtish, guided Norm Amstrup to achieve that magical 8’’ plus mark. Season 2011 saw the bow hunters often out doing the rifle men. 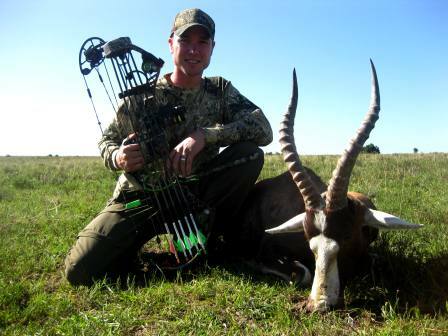 Josh Wilde’s new SCI # 3 Common Blesbuck took care of any further contenders. 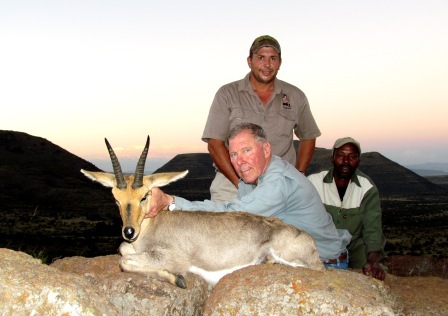 Lennart Packendorff’s Bontebuck was the biggest ever hunted at John X Safaris – we doubt another ram over 16’’ was hunted in South Africa during 2011. 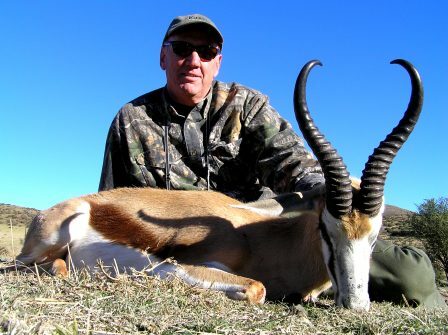 Tony White’s White Blesbuck may have been hunted near the very end of the season, that didn’t mean Tony was going to let any challengers contend with his ram. 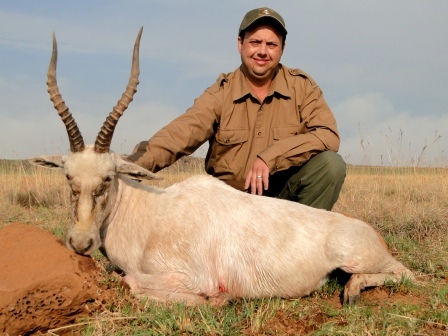 Paul Brisso’s Common Lechwe was without a doubt one of the most impressive bulls of the season. Combined with an amazing amount of patience he clearly highlighted himself as a favorite when it came to Lechwe during 2011. 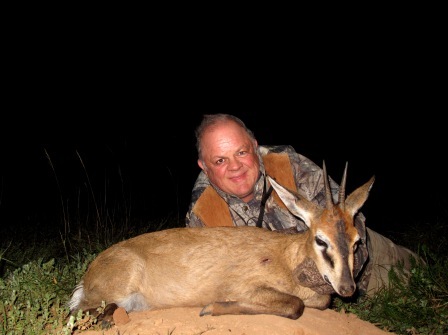 Dave Jensen’s Kalahari Springbuck had no challengers even coming near the quality of his ram. A truly amazing trophy! 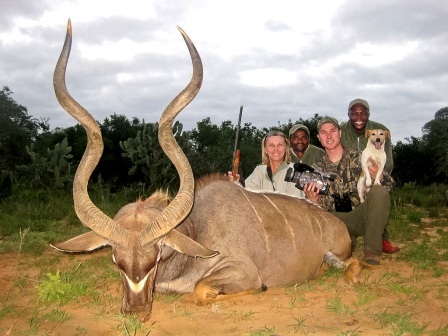 Impala are considered the most common game in Africa, we’re not sure if that made any difference to Candice Phillips when it came to her monster ram. Mike Verlander was back with a bang during 2011 boasting with yet another great trophy to add to his “Tiny 10” collection. 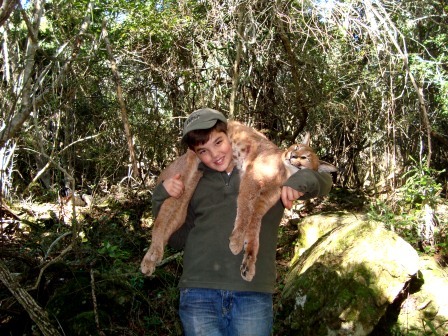 Inigio Ruiz enjoyed an exhilarating Caracal hunt with the hounds and his father, Ignacio, on their safari to the East Cape during 2011. After a spell of bad weather, the hounds finally gave us the break we were after, earning the “tom” of the season. 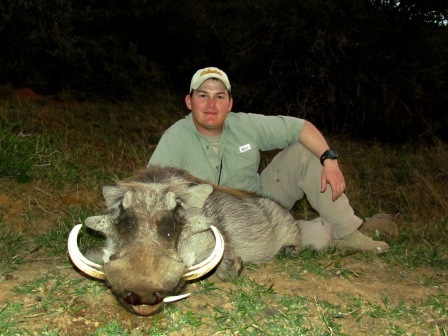 Ask any Professional Hunter which trophy they feel can be the hardest to achieve that above average size, and most will confirm that it’s a big Warthog. 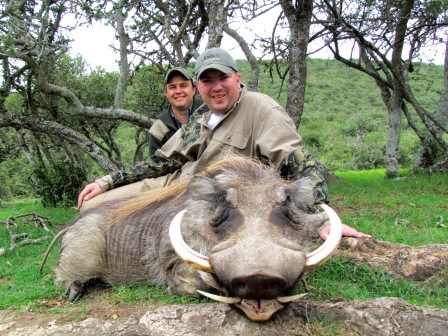 While Warthog are plentiful, it takes a trophy boar an extremely long time to reach that magical 15” mark. 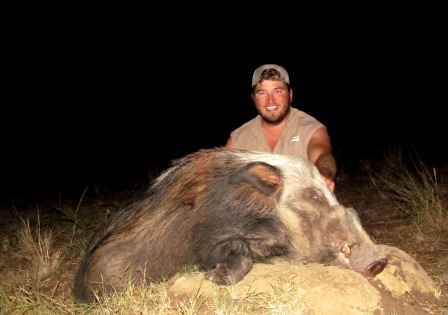 There were a number of very good pigs during 2011, but two particular boars, both hunted within 500 yards of one another, no more than 12 hours apart, led the pack. What made it even greater is that they were hunted by brothers. The first – Tim Tyner’s awesome boar! Brandon Graber’s boar was just as big! We leave the call up to you – either way we’re proud of hunting both. 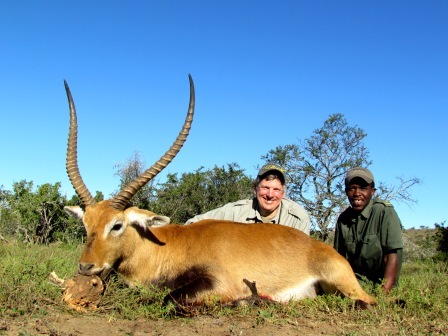 One of the all time favorite trophies hunted each season is the elusive Cape Bushbuck. Brad Bateman’s ram was just too good to leave out. What a trophy! 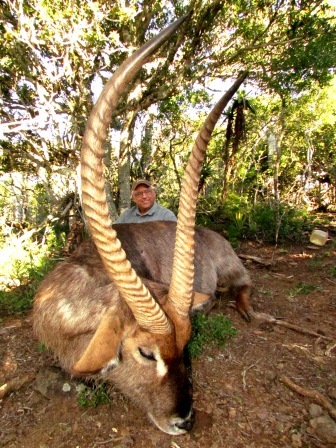 Ignacio Ruiz hunted what could be considered one of the trophies of the decade. A Cape Grysbuck that will be spoken about for many years to come. 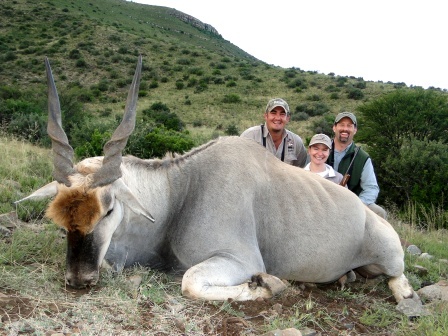 Steve and Lisa Dahmer never imagined the Cape Eland they’d bump into on their hunt to John X Safaris during 2011. When asked what Lisa would like to hunt on their African safari, this 5 foot tall lady beamed out;” The biggest!” We couldn’t have written the script any better! Every year there are a number of trophies that come within reach of that “trophy of the season” tag. At times it has not been the biggest, nor has it been the most elusive. It may have been the enjoyment of the hunt or what “that” particular hunt and trophy meant to a particular individual. This season was never going to be an average one, considering our “ridiculous” start in March. How else could one describe Brett Nelson’s Vaal Rhebuck? Surely it came as close to “ridiculous” if ever it could. This year not only saw our PH’s do an outstanding job in the field by achieving another season of first class results, our marketing and communications team were hard at it too. After the amazing success of John X Safaris’ first Coffee Table Book during 2010, we backed it up with yet another publication for 2011. Our John X Blog and Face Book Fan page have grown from strength to strength with over 2000 subscribers per month. 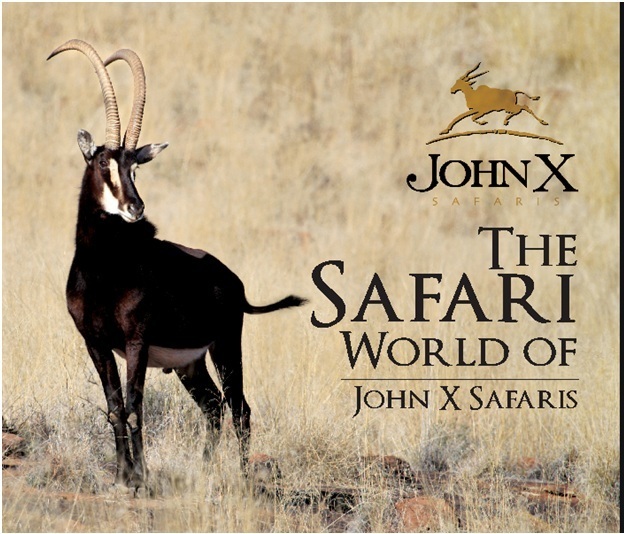 A new John X Safaris brochure is the latest edition to our collection. Feel free to drop us a line or give us a call if you may require any brochures or further information for friends and interested future hunters. We’d gladly assist where ever possible. John X Safaris Humanitarian Initiative 2011. John X Safaris Humanitarian Initiative came on with leaps and bounds during 2011. This year saw us adopting the Amasango Career School, a school catering for Aids Orphans living on the streets of Grahamstown. We would like to thank and commend the following people who’ve been a part of our Humanitarian Program during 2011 – Brett Nelson, Jim Haselberger, Dave Tyner, Tim Tyner, Mike Turnipseed, Brandon Graber, Roger & Peggy Christianson, and Robert & Shandra Olsen Christianson. Without your generosity and support we would not have been able to achieve the programs goals during 2011. Thank you. On a sad note we regret to report the passing of Boy, our head tracker and friend, on 29/11/2011. Those who were fortunate to have shared as many hunts as we have shared with him will agree that Boy was one of the best. The complete optimist – always eager to hunt, with a smile not far below the surface. Boy will be sorely missed by his family, Carl, and his team of Jack Russel Terriers. Boy – Thank you for the memories. Looking towards the future and 2012, we look forward to seeing as many of you as possible during our upcoming travels. Below is a quick reminder of our 2012 Show and Travel Schedule. If you or any of your friends are interested in meeting with us, please drop us a line, we’d be glad to fit you or them into our schedule. To each and everyone who joined us on safari this season, it has been a privilege having you hunt with us. 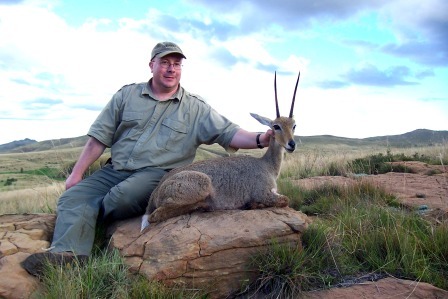 To those who will be returning, or are embarking on their first hunt to John X Safaris during 2012, we look forward to the adventure and sharing our John X Safaris experience. 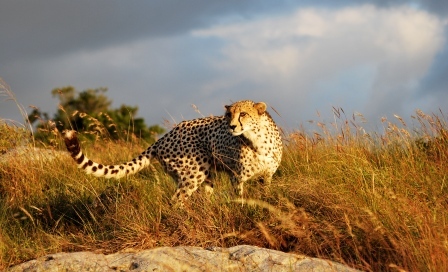 Please note – John X Safaris will be shutting down from 14 December 2011 until 2 January 2012. We will be checking mail on a weekly basis during this festive season.